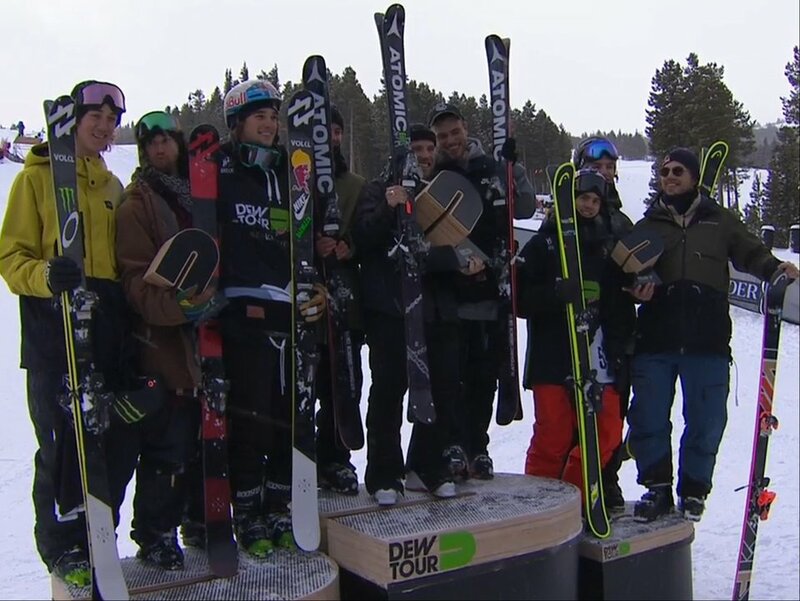 The 2016 Dew Tour is officially done for this year and it's fair to say there were some amazing highlights and some less than ideal conditions over the course of the weekend. The reimagining of the event overall was also more successful in some aspects than others, I'm sure that the post-mortem will continue for some time as we plan for bigger and better in 2017. Staying with this year for now, the final event of the weekend, the Team Competition, was unfortunately the hardest hit by the weather. Wind forced the cancellation of the team jump section entirely and so the jump guys suddenly found themselves in a rail jam. Luckily the snow had cleared a bit by the time it came to their runs and they hit the jib course in probably the best conditions of the weekend. Tim McChesney opened things for Faction putting down the only trick in the world on the wallie to rail and a lip 4 on the bottom down rail for 77. Joss Christensen nailed a significantly better run than he managed in yesterdays individual event with a handful of 4s scoring 81.0 for K2. Evan McEachran was slaying before a bobble at the bottom. Nick Goepper put down a squeaky clean run of tech bangers for an 88. As an aside, seeing Ahmet follow filming Nick was one of the stranger sights of the weekend. 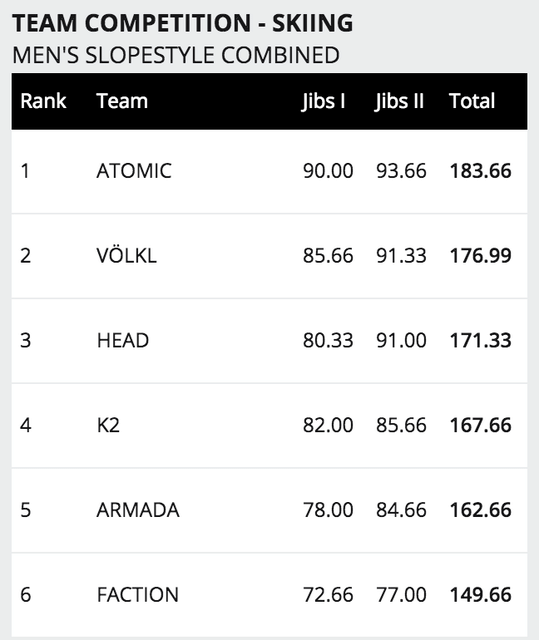 Jossi, the Atomic Team Captain, tagged himself in for Fabian Boesch when the venue switched to rails and on his first run, proved exactly why with a 92.0, the highest jib score of the weekend. Creative line choices and bangers on bangers including a switch 6 at the bottom. Henrik also stomped his best jib run of the weekend with a ridiculous 4 on pretz 2 on the long drop down rail for 84.66. Turns out the snow yesterday and this morning did make a big difference because Run 1 was by far the highest average level of the weekend so far. After that, the second round started off with a few bobbles/crashes. Unsurprising since the guys were trying to step up the craziest runs of the weekend. Evan McEachran greased his run at second time of asking for a 91.0. Jossi was on fire putting down his both technical and creative run for the second time running but slightly more bobbled than run one. The final run of Dew Tour '16 was largely guys trying to overturn rankings that were all but set. Shoutout team K2 for the choreographed spray routine ender. Nick Goepper, targeting a 96.0 tried a ridiculous ender but couldn't quite get the switch 4 disaster pretzel 2 to work for him and Volkl remained second. Jossi Wells wins our hearts this weekend (as he often does) ending his unique run with switch 6 on 2 out on the bottom feature. It was a victory lap and he still posted a 93.66 for the highest jib score of the weekend. Henrik rounded out the weekend with his inimitable style but yesterday was his win, today the honours go to Jossi, Gus and Atomic. The level in this final event was pretty unreal, a great end to the weekend. The FWT stops in JaCanada!